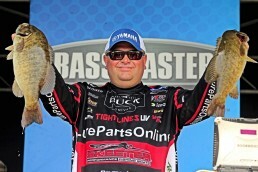 Bassmaster Elite Series veteran, Bill Lowen, has earned nine Bassmaster Classic berths, 14 top 10 finishes, finished in the money 88 times and cashed checks for over $1 million. Here are some of his thoughts on catching bass in the winter. Bill Lowen enjoys cold, frigid days on the water because he knows bass will be in well-defined areas they use year after year. They also hit one of his three favorite lures, and, by day’s end, he and his companions may have caught and released as many as 100 fish. 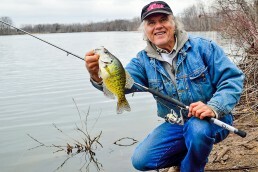 That does not sound like a normal winter fishing trip, but, through years of experience, he has learned how to tempt largemouth, smallmouth and spotted bass into biting. During a full day of fishing, he usually catches walleyes, stripers, white bass and other species, as well. Lowen’s three favorite winter lures are a jig, a blade bait and a suspending jerkbait. 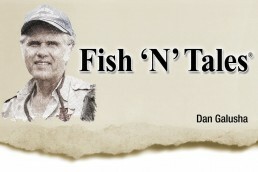 He knows other lures will catch winter bass, but these three are not only effective, but also easy for anglers to use. Lowen fishes them all in the same areas, too. Bill Lowen fishes a blade bait much the same way, casting shallow and slowly bringing the lure into deeper water. He uses a one-half ounce model he makes himself from components he orders. Blade baits attract bass through their vibrations. So, Lowen raises his rod tip slowly until he feels the lure vibrate, then lets it fall back to the bottom. It is a type of slow-motion hop, with a long pause before he raises his rod tip again. The suspending jerkbait is not fished right on the bottom. Rather, it’s fished with a sequence of jerks that take the lure down. Then, stop so the jerkbait remains relatively motionless near the bottom. This is the most difficult of his three lures to fish. Lowen regularly lets the lure suspend for half a minute or more before jerking it forward again. 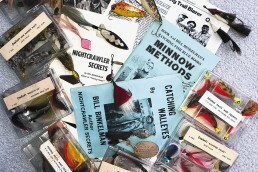 “Bass will hit each of these lures if you fish them slowly,” concludes Lowen. “The actual water temperature doesn’t determine which lure I’ll use, but, on any given day, one of these three usually out-performs the other two. Anglers in Illinois and Missouri have the option to fish their state’s warm water discharge lakes throughout much of the winter. Illinois has several. A partial list includes Braidwood, Clinton, Coffeen, Heidecke, LaSalle, Newton, and Springfield lakes plus Lake of Egypt. Missouri has Lake Springfield, Montrose and Thomas Hill. Always check local regulations for closed periods, special fishing regulations and ramp conditions. Above all, remember most of this water is cold enough to cause hypothermia quickly in case of accidental immersion. Be especially safe when fishing in the winter. Looking for another cool way to brig in some big fish? Check out our article on bowfishing in the winter.